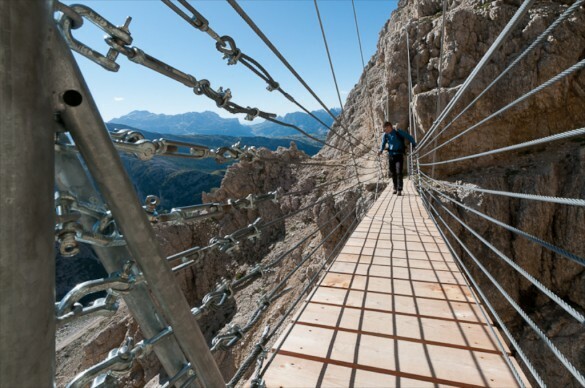 Experience the adrenaline rush of climbing a via ferrata – the “iron paths” of the Dolomites built during WWI. 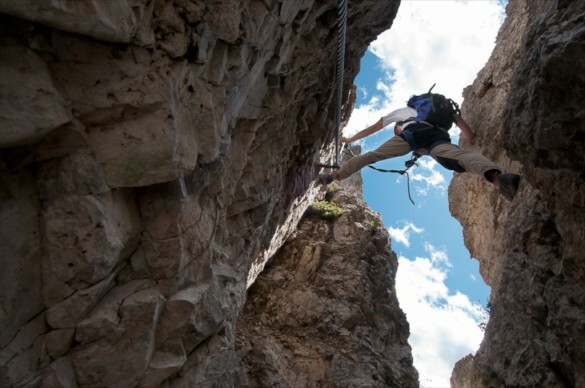 Climbing a via ferrata is an exhilarating way to enjoy the magnificence and sheer magnitude of the Dolomites. In this awesome mountain environment, protected on a rock wall high above the valley floor, you will be stopped in your tracks by amazing views while you learn valuable mountain safety skills. Via ferrata literally means “iron path,” originating from the metal ladders used by the military in WWI to navigate these mountains. While most of the ferrata have been replaced with newer hardware, they follow the same routes the military used, high into the mountains. Completely protected, attached to a system of anchored cables while you climb, you’ll enjoy vistas typically reserved only for mountaineers! Our via ferrata holidays provide an opportunity to learn the rope work skills required for the safe use of this type of route. 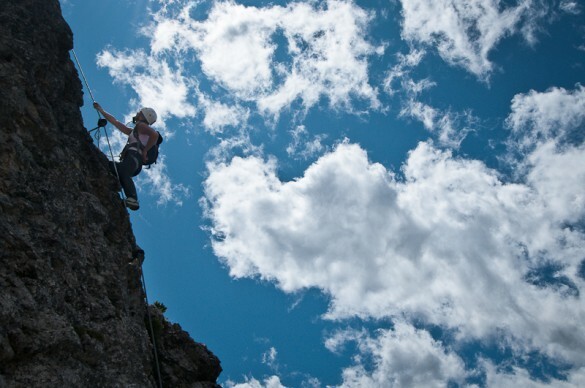 We also provide guided ascents of some of the most classic routes in the Dolomites. And, all of our via ferrata trips are led by UIAGM/IFMGA Professional Mountain Guides, ensuring your safety and enjoyment! 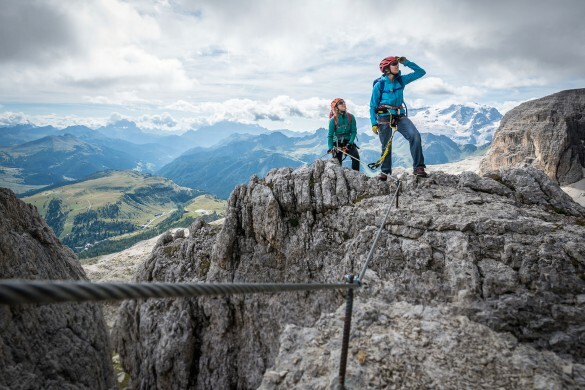 Traverse the Val di Fassa region of the Dolomites, climbing via ferrata and hiking! Traverse high above the valley, getting to know the regions trails and mountains, as you take in the majestic Fassa Valley and surrounding crown of peaks. 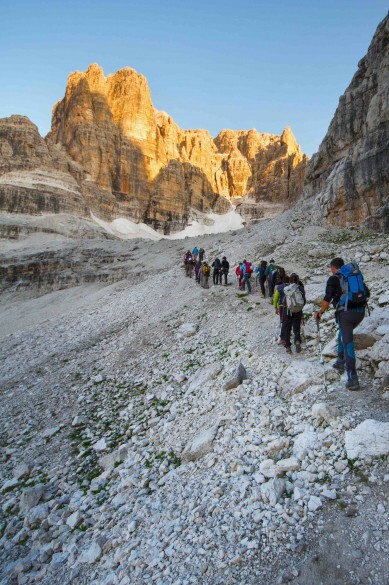 Hike and climb your way along Via Ferrata of WWI, trekking on the Dolomites Alta Via high routes, exploring fascinating WWI ruins and history, and ascending a different challenging via ferrata each day. 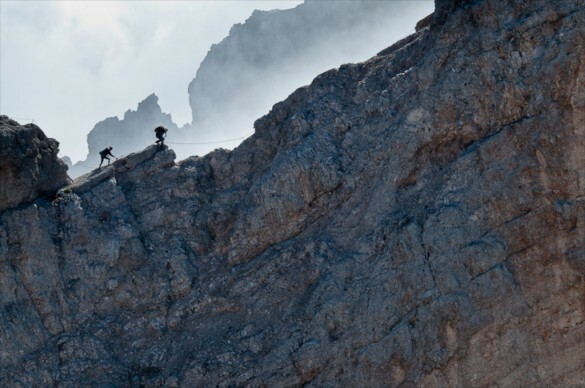 Challenge yourself and traverse the Dolomites from rifugio to rifugio while climbing some of the most famous via ferrata in the world! These “iron paths” set high into the mountainsides provide non-climbers access to high peaks and incredible vistas usually reserved for mountaineers.